As part of this morning’s Apple event, prior to show off the expected new iPad and iPad mini, the company also gave its venerable MacBook Pro line a refresh. As ever with such updates, it’s a case of smaller, faster, more powerful. The new MacBook Pro is 1.8 centimetres thin. Inside the 13-inch MacBook Pro is the fourth generation dual-core Intel Haswell Core i5 processor, or the dual-core Intel Haswell Core i7 processor. The processor options for the 15-inch MacBook Pro are the fourth generation quad-core Intel Haswell Core i7 processor, or the quad-core Intel Haswell Core i7. The claimed battery life for the 13-inch MacBook Pro bumps up two hours from the prvious model, now providing ‘up to 9 hours’, while the 15-inch benefits from an extra hour, ‘up to 8 hours’. 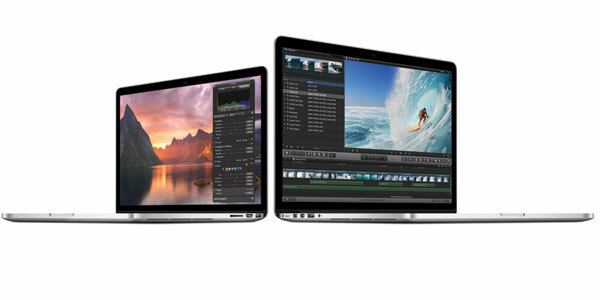 Both new models will ship with the new Mavericks operating system, the 10th update to OSX. Other included software includes new updates to iPhoto, iMovie, Garage Band, Pages, Numbers and Keynote. Both sizes of the new MacBook Pro will be available in stores today. 2.4 GHz dual-core Intel Core i5 processor, 4GB of memory, 128GB of flash storage, and Intel Iris graphics – pricing starts at $1,599 RRP. 2.4 GHz dual-core Intel Core i5 processor, 8GB of memory, 256GB of flash storage, and Intel Iris graphics – pricing starts at $1,849 RRP. 2.6 GHz dual-core Intel Core i5 processor, 8GB of memory, 512GB of flash storage, and Intel Iris graphics – pricing starts at $2,199 RRP. 2.0 GHz quad-core Intel Core i7 processor, 8GB of memory, 256GB of flash storage and Intel Iris Pro graphics – pricing starts at $2,499 RRP. 2.3 GHz quad-core Intel Core i7 processor, 16GB of memory, 512GB of flash storage, and Intel Iris Pro and NVIDIA GeForce GT 750M graphics – pricing starts at $3,199 RRP.